If ever proof was needed that local politics and elections work, it was very prominentlyprovided when Westminster City Council announced that it had withdrawn its support for the Mayor of London’s plans to pedestrianise Oxford Street. The U-turn was made after residents put forward anti-pedestrianisation candidates in the three wards bordering Oxford Street. The Labour party had been claiming that it could sweep the board in London and in the process take Westminster for the firsttime. But as the campaign went on candidates began shifting their stances on the issue, in some cases going from a position of general support to one of opposition. The major parties eventually came out to say that the residents should be listened to. Then, just two days before polling day, the City Council declared that Sadiq Khan’s plan was unacceptable. The question now is what will happen next? The cynics amongst us may say that Westminster will simply revert to its previous position of support now that theConservatives have secured the City council for the next four years. But I don’tthink that that will be easy to do. The residents would certainly fight it all theway should the council opt to backtrack. Ever since the proposals for the transformation of Oxford Street came to light I have been saying that nobody should underestimate the residents who had successfully fought off all previous attempts to pedestrianise the street. In view of this, the LTDA carried out a grass roots campaign to support the residents. know, but while the mayor will not be content to just let one of his flagship policies be kicked into the long grass, he will have a hard job regaining the support of the City council. And, even though he may be able to take over control of the road, the council and the residents could make that a long and painful process. It is a concern that the plans could be revised to offer people more protection from displaced traffic etc. This could mean that access to bordering streets could be further restricted and some of the crossover routes withdrawn. This could make it even more difficult for the taxi trade to ply its trade around Oxford Street. 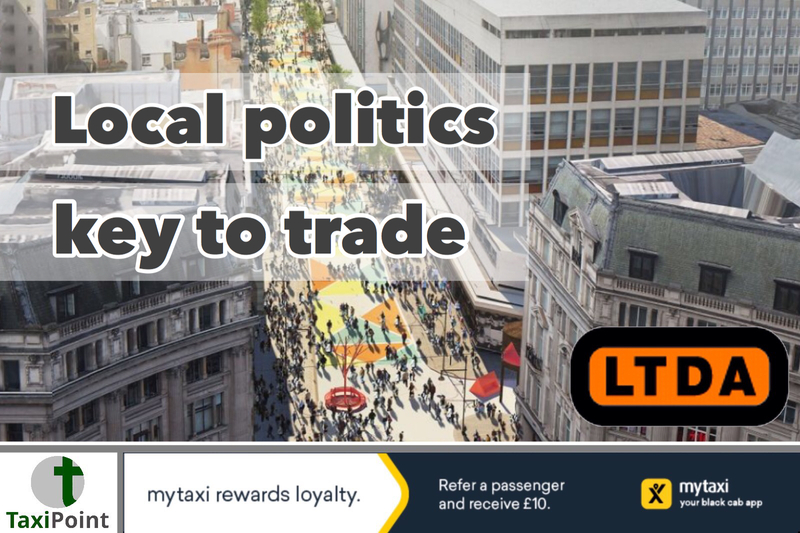 The LTDA will be keeping a very close eye on developments over the coming weeks and months. One thing that does seem almost certain is that the street will not be closed to traffic by November this year as previously proposed. All this has shown once again how important local politics can be to our trade. I can’t urge anyone with an interest strongly enough to get involved, you don’t need to be a member of one of the larger parties, although having more established network behind you can make it easier to get elected, independents also have a very good record in local elections. Just by being a member of a party locally you could influence the polices of the people elected as councillors. Due to the importance of the elections, the LTDA wrote directly to around 2,000 candidates and received a significant number of responses. Even those that did not respond now know much more about the taxi trade than they did before. Since the elections I have received messages of support from elected members in boroughs such as Camden and Islington, who have offered to work with the LTDA on some key issues in the future.